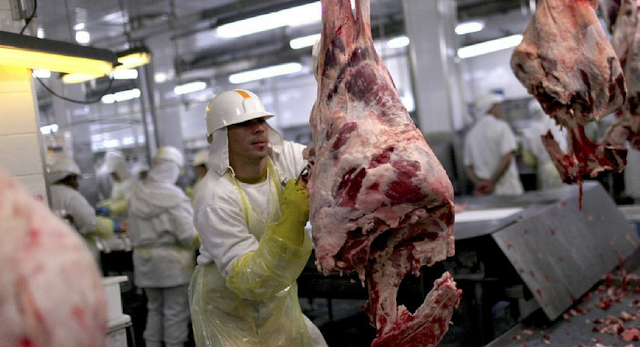 Following an investigative probe known as Operation Weak Flesh, which found evidence that several meatpacking companies in Brazil were guilty of bribing inspectors and politicians to overlook unsanitary practices in order to secure official certificates, China, Chile, and the European Union have imposed bans on meat imports from the country. The scandal, which involved meatpacking companies processing rotten meat and shipping salmonella-laden exports, has resulted in China blocking all meat imports from the country until such a time as the scandal is cleared up. “Until it receives more information, China will not unload meat imported from Brazil,” the Brazilian agriculture ministry said on Monday. The European Union has taken a slightly less drastic approach, calling on the Brazilian government to immediately halt exports by the four implicated companies, rather than implementing an outright ban. This is according to spokesman for the European Commission, Enrico Brivio. In Chile, a temporary ban has been placed on meat imports from Brazil, Agriculture Minister Carlos Furche announced via the micro-blogging platform Twitter. The ban will remain in place until all companies exporting meat to the country have been properly vetted. Temer also invited ambassadors from several countries to a Brazilian-style barbecue in a further effort to convince them of the safety of Brazilian meats. The meat-export market is vital for Brazil’s economy, with China, incorporating Hong Kong, being the country’s largest overseas market, which means that China’s decision to implement a full ban could cause significant economic issues. Brazil also exports to more than 150 other countries including Japan, Saudi Arabia, and Russia, with sales in 2016 reaching $5.9bn in poultry and $4.3bn in beef. “Brazil is facing a potential loss of export revenues of about $3.5bn. That's the equivalent of about 0.2 percent of GDP,” Capital Economics said.